See the angel in the forest? Soften your eyes and look for the light shining through. The angel lives in a very special cedar grove near Issaquah, Washington where I am staying right now. You can tell that the devic being is happy and well cared for. She appeared in this photo for one thing! And, when you walk in the forest you can take a full deep renewing breath and feel the peace and harmony of the land… and your own body. The deva is content, in part, because there is a human angel that cares for the forest. My sister-in-law, Michelle, loves stewarding the land. She flows with unlimited gratitude. 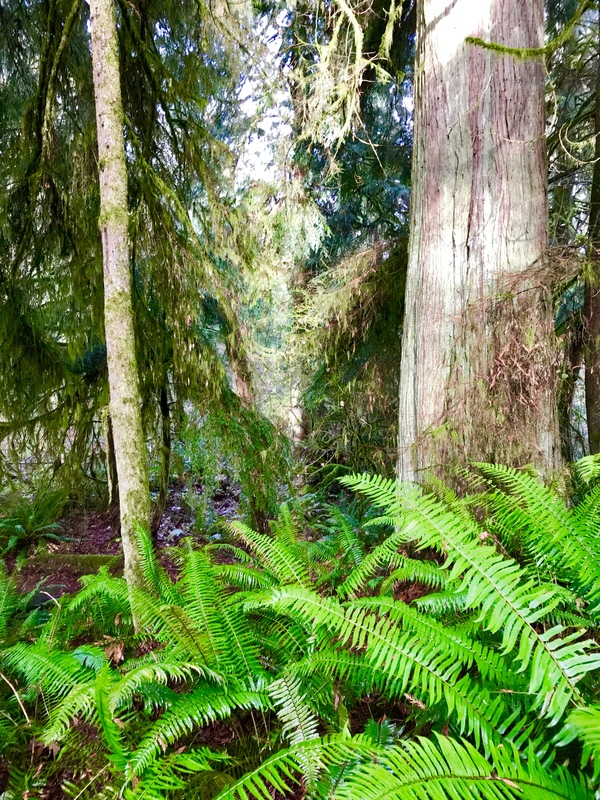 She spends time keeping the forest clear of non-native plants, talking to the sword fern, listening to the birds, protecting the wildlife, and learning how to attune to the subtle energies of nature spirits, elementals, and fairies. I’ve been sharing some ways for her to deepen communication with the spirits of the land and honor their presence. Michelle prefers to leave the land alone and simply be an observer of relationship. She asks nature: Why is it that the huckleberry loves the cedar? Why do some plants care for each other? 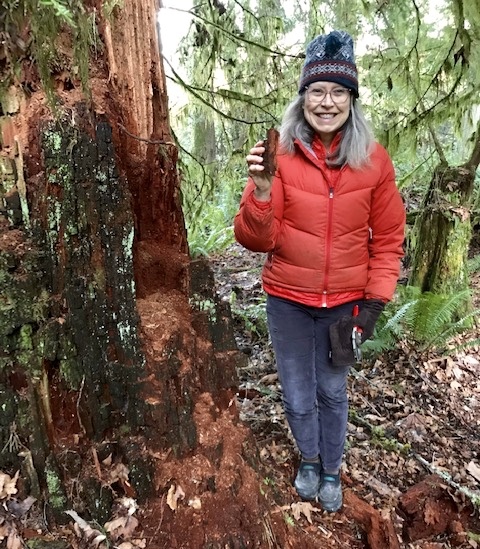 She notices the super nutritious haven of tree fall for new life—a dead tree becomes mother for more huckleberry. Nature naturally mothers. Michelle mothers the forest and receives loving care and mothering in return. Angels helping angels. The forest teaches her how to be One with all of creation. Thanks to the loving relationship between the land and Michelle (and her partner Dave) at Raven’s Reach there is harmony for all beings. We have make offerings and ask permission to work with the spirits and energies of the land. We created a fairy altar by laying down crystals and making offerings to the fairies in a sacred clearing in the forest. Issaquah comes from a word that means sound of water birds. Love and blessings to Raven’s Reach. June 22-23, 2019 Raven’s Reach will host an Earth Camp to explore land honoring and connecting with the spirits of land. It is such a magical, vibrant land and a perfect place to film some videos for upcoming on-line Earth School courses.